Adapts "A World Apart," "The Journey Begins" and "Brave New Digital World"
In the wake of Vikaralamon's rampage, events take a sudden turn, as Makuramon snatches Calumon from Jeri's hands. Leomon appears and attempts to stop him, only to be cut down, allowing Makuramon to escape back to the DigiWorld. A D-Power appears for Jeri, proving that she and Leomon are partners, and she heals him with its light - but there's no time to stop and reflect on events, as the Tamers realise they must follow Makuramon into the DigiWorld to rescue Calumon. Guilmon discovers a portal to the DigiWorld beneath his hideaway, and Takato is forced to tell his parents about everything, who give him their blessing. The next morning, as everyone gathers to enter the portal, Yamaki turns up to give Takato a communicator that will allow them to contact the real world. Then, the team enters the portal, arriving in the barren desert of the DigiWorld. After walking some distance, they suddenly find themselves under fire from an unseen enemy. Adapts "Brave New Digital World" and "Kazu and Kenta's Excellent Adventure"
Chapter Seventeen: "Bigger is Better"
Adapts "Kazu and Kenta's Excellent Adventure," "Motorcycle Madness" and "Blame it on Ryo"
Impmon is approached by Chatsuramon, the dog Deva, who offers him the power to Digivolve. He subjects him to a vision of his old owners, encouraging him to forget humans, and Impmon accepts. Meanwhile, Takato's team have made their way to a village of Chuchidarumon, which is under threat from Behemoth, a monstrous motorcycle. Gargomon and Leomon battle the bike, and Leomon blasts it, knocking free its rider - a MetalKoromon, who explains that the bike takes over the mind of anyone unfortunate enough to sit on it. Suddenly, the bike springs back to life, and drives into an energy field that appears in its path - then, it bursts out of the field, now with Beelzemon, Impmon's Mega form, in the driver's seat and in control! At the same time, Rika and co. leave Jijimon and Babamon's valley with the help of a hang glider, and wind up in a strange realm of clouds and clockwork. When Kazu tampers with a clock, an angry Megadramon emerges! Adapts "Blame it on Ryo" and "Goliath"
Renamon Digivolves into Kyubimon to fight Megadramon, but proves to be no match for him. Then, suddenly, a new Digimon, Cyberdramon, appears, and quickly fells Megadramon. Then, Cyberdramon's Tamers enters the scene, and Kazu and Kenta quickly recognise him - he's the famous Digimon card game champion, Ryo Akiyama. They heap praise upon him, and Rika, sick of listening to it, leaves them to go off on her own. Kazu, Kenta and Ryo then meet up with Takato's team in a twisted monochrome village. Meanwhile, in the desert, Calumon is wandering alone, and begins to entertain himself with a stray digital tumbleweed. In his merriment, he unleashes the light of Digivolution, which transforms a nearby Woodmon into a Cherrymon, and alerts Makuramon, and the dragon Deva, Majiramon, to his presence. Spotting Majiramon in the sky, the Tamers follow him, and battle ensues. Chapter Nineteen: "Calumon Once Again"
Adapts "Goliath" and "The Imperfect Storm"
Ryo slashes the Goliath card, and Cyberdramon grows to a colossal size, easily finishing Majiramon. He and Ryo then leave the Tamers. Rika and Renamon, meanwhile, are led to Calumon by some DigiGnomes, and they then head back to reunite with all the other Tamers - except the reunion is interrupted by Beelzemon, who, having tested his new strength by battling and destroying an Infermon, is now here to destroy the Tamers. Kyubimon realises that he is Impmon, and Beelzemon prepares to destroy her first. Chapter Twenty: "Kazu's Non-Ryo-Related Dream Come True"
Adapts "The Imperfect Storm" and "Kazu's Upgrade"
The reactivation of the Juggernaut on Earth creates a massive storm that prevents Beelzemon from finishing the Tamers, but it allows Chatsuramon to seize Calumon, while Takato, Henry and Terriermon are transported away from the rest of the team by Data Streams. Yamaki manages to shut the system down, and realises that he needs to find Goro Mizuno to fix the mess he has created. Winding up in a wooded area, the rest of the Tamers team comes across the injured Andromon, who is nursed back to health by Kazu, and De-Digivolves into Guardromon. He explains he has been trying to free the area from the clutches of the evil Orochimon, but an angry Gekomon cuts into the conversation, saying that all Guardromon's efforts result in is more trouble. Guardromon can't accept this, and calls Orochimon out - the villain complies, and the resultant battle does not go well until some advice from Kazu allows Guardromon to strike Orochimon's weakest point, finishing him off. Then, amidst the celebrations, a D-Power appears for Kazu, signifying that he and Guardromon are partners. Chapter Twenty-One: "The Riddle That Is Guilmon"
Adapts "Shibumi Speaks" and "Rabbit Transit"
Takato, Henry and Terriermon find themselves in an underwater cave, where Takato receives a message on Yamaki's comm. device, clueing Henry into the fact that the water isn't real by the fact that the device works, even though it got wet. The trio dives in, planning to swim out, only to come across a strange mansion under water. Entering, they come across Goro Mizuno, a.k.a. Shibumi, one of the creators of Digimon. He rambles somewhat, about the nature of data, Digimon and Digivolution, before the three are transported from the mansion in a giant D-Power-like craft. Back on Earth, Yamaki and Janyu Wong meet to discuss Shibumi, but as they talk in the park, Suzie, Henry's little sister, is caught in a beam of light from the sky, and transported into the DigiWorld. Once there, she immediately comes across Antylamon, the rabbit Deva, who she convinces into playing with her. However, when Makuramon spots Antylamon playing with a human, he attacks him for treachery. When he then turns on Suzie, Antylamon defends her, sending Makuramon packing, but then, the Sovereigns drain his power, reverting him to his Rookie form of Lopmon. While preview images of the previous two volumes of the Tamers manga showcased preliminary logo designs, this volume's preview (right) was the first to display the finished logo, although the rest of it's design changed somewhat. Rika's image has been shrunk, allowing more of her jeans to come into view, while the background was changed from pink to green, and Kyubimon and Taomon were added. The cast page changes with this volume, adding the Ultimate forms of the Tamers Digimon, Jeri, Kazu, Ryo and their Digimon, Beelzemon, Makuramon, Chatsuramon and Majiramon, and, under a section labelled, "Not As Important," Kenta, Suzie, Calumon and Yamaki. There is a mistake here, in which the labels for "Kazu and Guardromon" and "Ryo and Cyberdramon" are swapped. Also, on this page and throughout this volume, Guardromon's name is misspelled as "Guardramon." Much of "The Journey Begins" is dropped. All that remains from it is Guilmon's discovery of the portal, Takato asking his parents' permission, and the team gathering to leave and getting the communicator from Yamaki. This also marks Takato's parents' official introduction in the manga, and the manga really fails to convey any of the emotion the anime displayed in this episode. Upon entering the portal, the Tamers simply start falling after a moment, rather than having Jeri decide which way is "down." The scene where a mass of data packets roll past the kids, followed with the onset of night, is dropped, as they are attacked by Meramon in the daytime, and then the scene transitions to them talking to him at night. No-one is asleep for the Jagamon stampede, and it is what carries off Rika, Renamon, Kazu and Kenta, rather than a data stream. Meramon is not explicitly stated to die. Guilmon is not taken over by Behemoth. Jijimon and Babamon don't fight, and there's no attempt between them, Kazu and Kenta to establish a partner-Tamer relationship. They happily allow them to leave, helping to build the hang glider, which takes them directly to the land of clockwork and clouds, rather than back to the desert plain, as it did in the anime. Kazu is the one who messes with the clock, rather than Rika. The scenes from "Blame it on Ryo" showing how Takato's team got to the monochrome village are cut, as are all other scenes in the village from "Goliath," beyond their meeting up with Kazu, Kenta and Ryo. Terriermon and Guilmon don't eat the "chocolate," and the kids don't stay in the castle overnight. Only one of the Woodmon Digivolves, rather than all three of them. Cyberdramon finishes Majiramon off with a point-blank Desolation Claw, rather than a skull-crushing. The Earth-based scenes from "The Imperfect Storm" are cut, except for Yamaki's final shutting down of the Juggernaut. There is only one storm, rather than two, as in the anime. When Rika is reunited with Calumon, there's no flood involved - the DigiGnomes simply lead her to him. When Beelzemon goes looking for a fight, he finds an Infermon, unlike the anime, in which he found a swarm of Chrysallimon, which then merged into an Infermon. The events of "Kazu's Upgrade" are greatly compressed. The Tamers find the wounded Andromon and tend to him on the spot, rather than taking him to the Gekomon village after seeing him injured in battle with Orochimon. There is only one battle with Orochimon - he never captures Jeri, hence there is no plot to get her back, hiding in barrels, etc, and the fight is not won by a Digi-Modified Leomon, but by Guardromon, who, acting on advice from Kazu, uses his Warning Laser to blast himself straight through Orochimon's centre head. Grody. Henry's deduction about the water is simplified for the manga - there's no talk of it being what you believe it us, but rather, the general statement that "it's not real." The scenes with Divermon and the Otamamon are dropped, and they don't travel through a pipe - they simply find Shibumi's mansion under the water. And Shibumi's ramblings are also greatly simplified. Suzie doesn't simply get surrounded by a cloud of data and light, as in the anime, but is instead very openly sucked up by what is referred to as a Data Stream (but which can't actually be one, since they don't exist in the real world). She encounters Antylamon right away, rather than having a few nasty meetings with other Digimon, and as she never saw Terriermon fly by the D-Power craft, she just wants to play with Antylamon, rather than to go looking for Terriermon. Makuramon doesn't capture Suzie when she is alone, forcing Antylamon to come to her aid, but rather attacks Antylamon directly when he sees them together. Henry, Takato and Terriermon do not arrive during the fight - Suzie and Antylamon are alone when Antylamon is reverted to Lopmon, and a D-Power does not appear for her at this point. 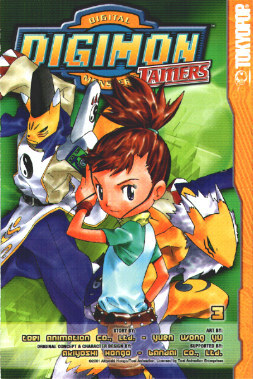 While the Tamers dub used the term "Digital World," rather than "DigiWorld," the favourite term from Adventure, the Tamers manga doesn't make the change, continuing to refer to it with the contracted term. Also, continuing the slightly annoying trend of much of Digimon's published western media, it persists in just calling it just "DigiWorld," rather than "THE DigiWorld." Curiously, Behemoth (which is indeed referred to by that name in the manga, never used in the dub) is referred to as being a Digimon by MetalKoromon (who, along with Chuchidarumon, do indeed retain these names, which the dub created for them). Antylamon/Lopmon is only referred to with a gender once, but Suzie uses a male pronoun when she does so. It remains to be seen if this will carry over to the fourth volume, but for now, Lopmon is male in the manga, as he was in the original Japanese version of the anime (although it's odd, given the English adaptation's fondness for sticking to the dub). And now, I must editorialise for a moment. I don't consider these guides that I write to be "reviews," but there is one thing about the mangas I just *have* to sound off about. I've mentioned before, and readers will know, that the manga includes some degree of humour where the original did not, and adaptation writer Lianne Sentar notes on her website that she does it add a bit of life to the rather thin original scripts. Often, the humour she uses makes fun of some parts of the story (for example, in this volume, a YukimiBotamon fleeing from Infermon squeals: "So... hard... to run... without... LEGS!"). I don't have a problem with that. However, something which has been occurring with more and more regularity is how incredibly *over-written* and consequently ill-fitting this humour has become. Take Chapter Twenty's title: "Kazu's Non-Ryo-Related Dream Come True." Long much? The one that really pushed me over the edge, though, was Calumon's little cheer as he chases the data packet - "I could spend the rest of my life isolated, so long as I've got this arbitrary object!" Does this sound remotely like anything Calumon would say? No, it's an over-written joke about the character's child-like change of mood. These odd-sounding exclamations have been popping up throughout the manga's run - essentially, I'd describe them as characters voicing the audience's thoughts. But it's got a bit out of hand this volume, and they're verging on intrusive. Okay, rant off.